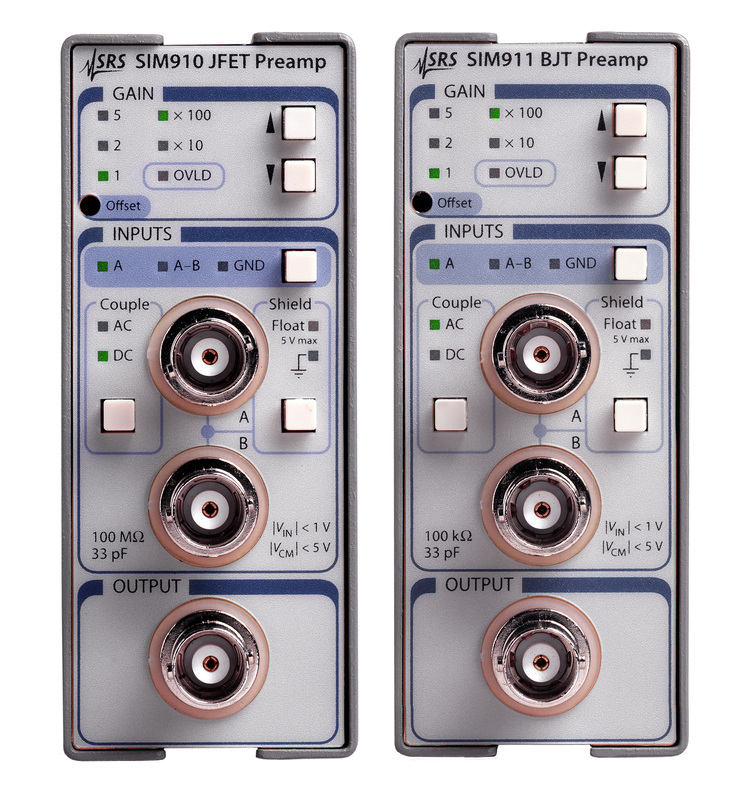 The SIM910 and SIM911 are low-noise, programmable preamplifiers which are ideal for a wide range of small signal applications. The primary differences between the two models are their input impedance and input noise. The SIM911 has a bipolar junction transistor front-end, offers lower input noise, and has a 100 kΩ front-end impedance. The low bias current and 100 MΩ input impedance of the SIM910, which has a JFET front-end, make it a better choice for use with high impedance sources. 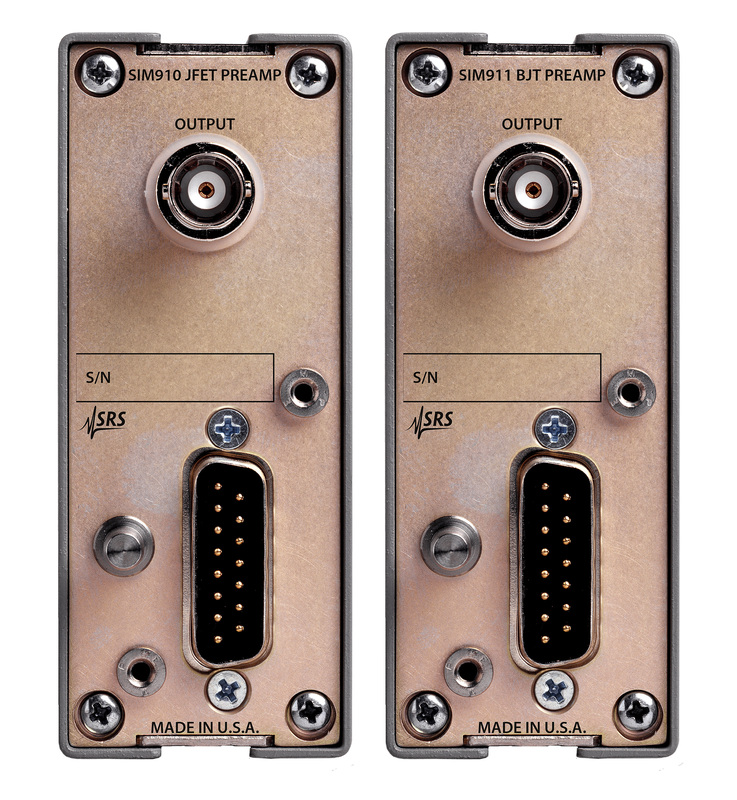 Both modules maintain very low output noise resulting in exceptional overall noise performance—even at low gain levels. The bandwidth of these preamplifiers is independent of gain setting so waveforms do not change shape as the gain is varied. Dual parallel outputs (one front and one rear) provide flexibility in cabling. Inputs can be configured as differential (A-B), single-ended (A), or internally grounded, and can be either AC or DC coupled. Additionally, the BNC input shields can be floated, avoiding spurious ground loops when measuring remote signals. The digital control circuitry in the SIM910/911 is designed with a special clock-stopping architecture in which the microcontroller is turned on only when settings are being changed. This guarantees that no digital noise can contaminate low-level analog signals. Settings may be changed from the front panel or through the remote interface. All instrument settings can also be queried via the remote interface. The module generates a status signal to alert the user of an overload condition. Both the SIM910 and SIM911 can be operated outside the SIM mainframe by powering them with their required DC voltages.